This is a reservation form: registration is complete and your seat is secured when we receive payment. Multiple children may be combined on one check. You may also pay online below. I give permission to Alma Community Art Center to release images of the registered student and/or registered student’s artwork in exhibitions or promotional materials for Alma Community Art Center. The full week is Monday through Thursday, 10am-2:30p.m for $70 Or you can pay $20 per day, and choose the days you want to attend. Scholarships are available! 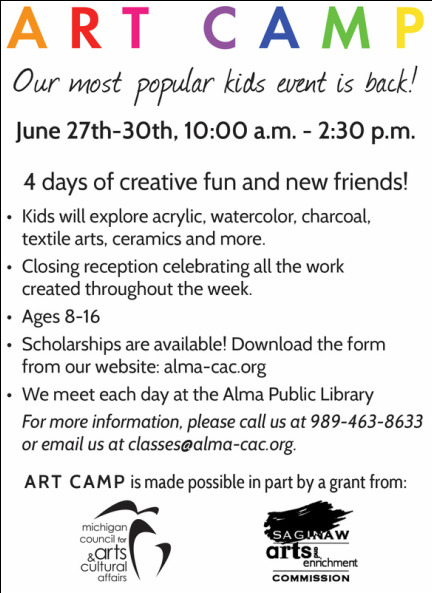 Please contact Steven Hawkes at 989-463-8633 or manager@alma-cac.org for more information. If you prefer not to pay by credit card, please use the online form above or download and print the registration form. Payment must be received 5 business days prior to the class for your seat to be secured. If you prefer to pay at the door, seating is first come, first served by availability.